I’ve never upgraded Ubuntu in my laptop. What I do is perform a clean install of a new version. This is a habit carried over from Windows and retained because I hate to wait for downloading of files to complete while doing an update to a new release over the Internet. A new install, after all, takes just a few minutes and I take pleasure at customizing my installation all over again. I downloaded the beta version of the desktop edition via Bittorrent and burned the ISO file. Installation was a breeze and after just a two-stick cigarette break, Hardy Heron was already running in my laptop. The first thing I did upon logging in was check for updates. The update manager listed 287 files to download, amounting to a whopping 128 megabytes. At least two more update queues had more than 200 megabytes of files each. UPDATE QUEUE. When you install the beta release, be prepared for frequent application updates. If you install the final release, you won’t have to download huge file updates. Click on photo to enlarge. What I did was I left the laptop on and worked either on my office desktop or my Asus Eee PC. If you want to go over the details, including the minutia, of the new things in Ubuntu Hardy Heron, just go to the Ubuntu website. 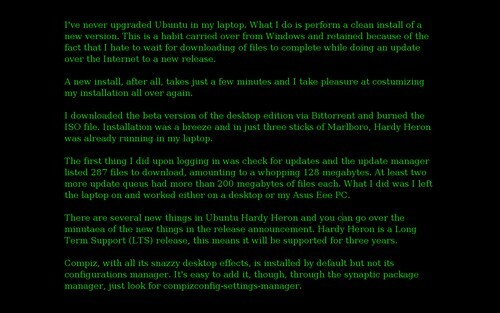 Hardy Heron is a Long Term Support (LTS) release, this means it will be supported for three years. Compiz, with all its snazzy desktop effects, is installed by default in Hardy Heron but not its configurations manager. 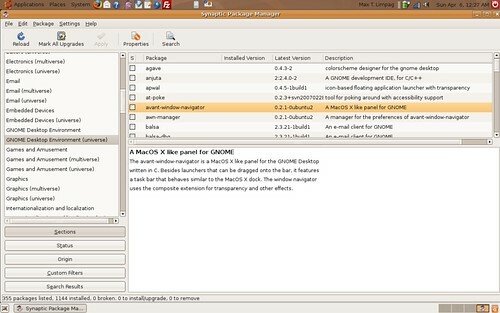 It’s easy to add it, though, through the synaptic package manager, just look for compizconfig-settings-manager. The network manager applet has improved compared to when I last used it in Feisty Fawn and I saw no need to install wicd, my manager of choice for LAN and wireless connections. Firefox 3 beta was installed by default but then removed in one of the updates. I just reinstalled it after a few days. GET YOUR DOCK HERE. Avant Windows Navigator, a cool applications launcher dock, can be easily installed from the repository. Click on photo to enlarge. Avant Windows Navigator or AWN, a cool Mac OS X-like dock, is now in the repositories and can be installed easily using the package manager. If you want to start AWN, just include it in the list of startup programs in System > Preferences > Sessions. The command is avant-window-navigator. Using Bluetooth also seems so much easier in Hardy Heron. In previous versions, I had to wrestle with using the command line to detect my Bluetooth USB dongle. After a few unsuccessful attempts, I gave up (what can I say? I’m lazy). With the Bluetooth tools in Hardy Heron, pairing is easier. I haven’t tried sending files from my Sony Ericsson P1i, though, because I encountered an error that I had no time to check yet. Hardy Heron also comes with the latest stable version of Open Office, which is 2.4. If is a full office software suite for writing documents, creating presentations, managing spreadsheets, among other tasks. But while Writer is a good writing software, I’ve always preferred to write my first draft on the minimalist and full-screen editor JDarkroom. NO-DISTRACTION WRITING. I write my drafts on JDarkRoom, a minimalist and full-screen editor. It’s easy to install JDarkRoom in Ubuntu. Just go to this site and download the jar file. To start the application, just open up a terminal and navigate to the folder where you stored the jar file and then type java -jar JDarkRoom.jar. After that, I CHMODed the file, again using the instruction in the forum post. I could now start JDarkroom by typing jdarkroom in the terminal. But, as I’ve repeatedly said, I have a terminal case of hatred for the terminal and so I created a panel launcher using whatever icon I could find in the system that had a pencil on it. With my writing tool installed, I proceeded to add other web development tools. The first program I added was Bluefish, a really good text editor that I use alternately with gedit, depending on my mood. I then added Filezilla for my FTP needs. Since I use versioning for some of my work, I installed the SVN Nautilus scripts via the package manager but couldn’t get it working. I just installed RapidSVN, taking time to say a short prayer for the emergence of a Linux tool akin to what TortoiseSVN does in Windows. With all the other tools installed, I then went on to download Aptana Studio, a really good IDE for web development. Aptana is my HTML and CSS editor of choice and I use it extensively for initial work with WordPress themes. I installed Aptana Studio last because I thought I’d encounter problems with it. It turned out installation was as easy as just unzipping the downloaded file. I then created a launcher for Aptana using the icon from this site. 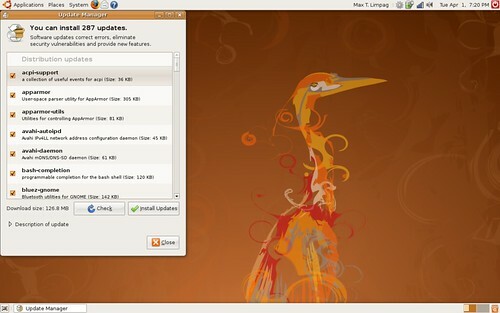 The Hardy Heron beta did not come with Wine, a software that allows you to run Windows programs in Linux. I wrote about installing Adobe Photoshop 7 in Linux previously. The current Wine version allows you to install and run Adobe Photoshop CS 2 in Ubuntu Linux smoothly. I had to install Photoshop because I still haven’t gotten around to learning how to use Gimp (soon, I know, soon). Adobe Photoshop CS 2 running in Ubuntu Hardy Heron using Wine. Overall, Hardy Heron is a great release. With its ability to be installed in Windows, I’m sure more people will be trying out Linux for the first time using the Hardy Heron release. I told a colleague, who is about to embark on a career-changing project, to use Ubuntu for the computer component of his program. He agreed and I’m excited for it to start. Since I started using Ubuntu last year, I’ve never encountered major problems in my laptop. Maybe I’m just lucky with my MSI S260 hardware since I still read posts trashing Ubuntu hardware support. The only thing that’s not working in my laptop is the built-in card reader. I tried looking for fixes last year but just gave up and bought a cheap USB multi-card reader. Part of me keeps saying Hardy Heron will be the last version in this laptop. I don’t know whether its specifications can still meet requirements of coming development releases. But let’s see. Six months from now. But from here on, it’s Hardy Heron. Good decision. I also couldn’t wait for the final version so I got Hardy Heron RC, but I prefer Xubuntu. Just did a clean install. Wiped out my 7.10 and installed 8.04. We should have a release party! I’ve read from Sunstar that you’re giving out a copy of Ubuntu. May I ask a copy from I’ll appreciate it..thanks a lot. Nice review. I just want to say that nautilus svn’s script is probably correctly installed but you should activate it. nautilus-script-manager works fine for this issue. RapidSVN worth much more than nautilus’s scripts. I’ve read your article about Ubuntu free CD, tried to access its website but I have not received a reply from them. I’m planning to install it to our computers in our school. CanI have a copy of that CD? hello! i have read the news paper last may 05 about this new linux. you said in your article that if we want a copy just contact you. how can i get a copy? and how much? im interested. Thanks for the update. I’ve just enabled it. Will still try working with my subversion repositories. For all those requesting CDs, my request from Ubuntu still hasn’t arrived but I’ve burned a copy. I’ll add a comment here on how you can get the CD. 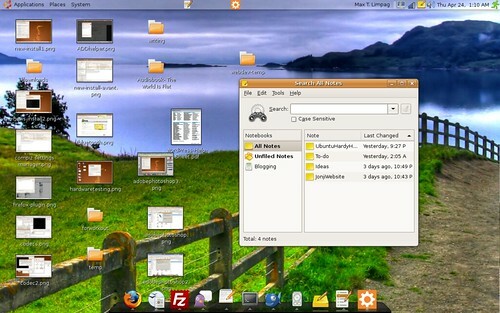 Ubuntu can be installed in any desktop or laptop. With the latest version, you can now install it under Windows. regarding your article on sunstar, i really think ubuntu is not a pirated OS replacement. it is something that gives freedom to the users. I just assembled my own PC. I powered it with Ubuntu 7.10 using the Live CD and viola! Ubuntu all the hardware of my PC, no need for an additional restricted drivers to be installed. And this is what I am using now. I encouraged everyone to use ECS 945GCT-M2/1333 Motherboard. This is powered by Intel 945GC chipset just to be on the safe side. You can email me on how you can get it. I have lots of Ubuntu CDs (Ubuntu & Kubuntu 7.10). I just received my Ubuntu 8.04 and I do a clean upgrade of my PC system. Ubuntu 8.04 really rocks in my system. Compiz fusion is great. Ubuntu is so easy, I can set it up with all in all in it in just an hour (depending on the connection of your internet). I agree, Ubuntu is more than just a replacement for a pirated Windows. But, it is also that. And for many people, that can be a lure toward trying an open source system. Of course Ubuntu is an operating system and does not need another operating system. But the latest Ubuntu comes with Wubi, which allows it to be installed in Windows. For many people, this a good way of trying out the system first for some time. While you can check the system out using the live CD, installing Ubuntu in Windows using Wubi allows you to try out a persistent Ubuntu install. If you want an Ubuntu Hardy Heron CD, just go to the Sun.Star Publishing Inc. office on P. del Rosario St., near the University of San Carlos main campus. Just tell the guard that you will be going to the newsroom to claim the CD. In the newsroom, look for editorial assistant William Rama, the CDs are in a sleeve tacked to his cork board. Leave your name and e-mail address to acknowledge that you got the CD. Please feel free to pass it on.